Patton Oswalt: Falling In Love Again Was Like 'Getting Hit By Lightning Twice' After the sudden death of his first wife in April 2016, Oswalt felt his life slipping away. But over the past year, things took a turn: He fell in love again, and now he has a new Netflix special. Patton Oswalt co-starred on the comedy series King of Queens and voiced the main character in the Pixar film Ratatouille. More recently, he has appeared in Veep, Justified and Young Adult and other TV and film roles. After the sudden death of his wife, Michelle McNamara, in April 2016, comedian Patton Oswalt felt himself falling apart. He began drinking and eating bad food and he struggled with insomnia. "I was beginning to kind of kiss the edge during those months," he says. "I felt like I was fading out of the world ... just sort of treating myself like I had already died." But Oswalt also knew that he had to pull himself together — if not for his own sake, then for the sake of his young daughter, Alice. He turned to the one place where he could express his grief in a constructive manner: the stage. "I started going back onstage in August of that year, completely not ready and completely feeling incapable," he says. "But also I went onstage out of that feeling of, 'I don't know what else to do. This is what I've always done about everything else, and I don't have another outlet to express and work out my grief.' "
Over the past year, Oswalt's life has taken a new turn. 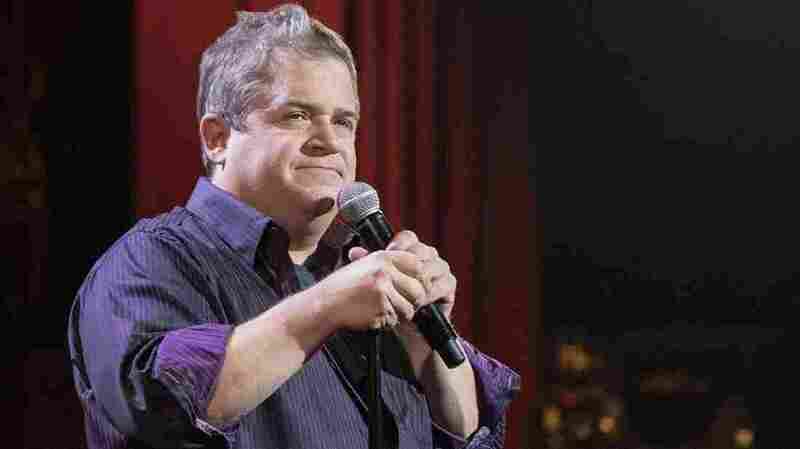 He met, fell in love and married actress Meredith Salenger, and he has a new Netflix special, Patton Oswalt: Annihilation, where he talks about the Trump era and the time he has spent processing his grief. The beauty of this format is that you give people and yourself the opportunity to hold up something that's unspeakable and not only speak about it, but to laugh about it and see that it's manageable and survivable and that you can evolve and adapt beyond it. I think ... sometimes she had a lethal level of empathy in her. I'm not going to be glib and say that's the cause of death — the cause of death was a lot of things — but that certainly held the door open for the other causes. I was lucky enough to meet and fall in love and have someone as extraordinary as Michelle McNamara fall in love with me. And then — it's almost like getting hit by lightning twice, that the statistical odds are so insane — I met someone just as, if not even more, extraordinary in this woman Meredith Salenger and fell in love with her and got her to fall in love with me and to fall in love with Alice. This is going to sound so facile, but she's Mary Poppins. There's that line in the movie Saving Mr. Banks: "She's not there to save the children. She's there to save the husband." That's what Mary Poppins is there to do. That is what Meredith has done for me and for Alice. Because she is such a life force, it almost feels like she was put here to see if her level of life force could revive this death vibe that I was living in and pull me out of it. And she did. She did, seemingly effortlessly. So it is a real gut check. And I savor the moments in my life when stuff that I was comfortably sure of gets completely shaken up and I have to re-look at everything, because that stripping down is what leads to growth and evolution. Even if it's painful for yourself. I've had to sit down these last few weeks and I'm going through my head — and I hope every other guy is doing this, of not even, like, physical acts — but, "Was there a remark that I made? Was there a way that I put things?" You're just constantly now thinking of that. I see a lot of people saying, "Oh what, men are now supposed to triple-, quadruple-, quintuple-think everything that they say and do?" And you go, "Well, clearly women have had to double-, triple-, quintuple- ... think and say everything that they do, and look at all that they can achieve and do with that load on them! Can we maybe take a little bit of the slack? Will that be OK, Mr. Alpha Male?" Lauren Krenzel and Seth Kelley produced and edited this interview for broadcast. Bridget Bentz, Molly Seavy-Nesper and Nicole Cohen adapted it for the Web.